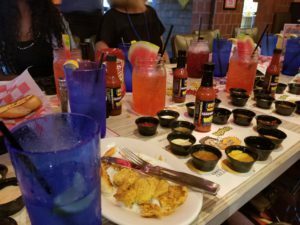 My daddy was descended from a long line of Cajuns, so it was my duty to accept an invitation to “Get Saucy at Razzoo’s.” Our ancestors came from France to Nova Scotia, then to Lake Charles, Louisiana. Some of my favorite childhood memories are feasting on Great Aunt Lillie’s red beans and rice, shrimp and crawfish dishes. For those who might be confused by the difference between Cajun and Creole food, Razzoo’s offers an easy distinction. Creole is city food, while Cajun is country food. Most Cajuns, like my dad’s family, ended up living in the low-lying, swampy regions of Louisiana. These French immigrants had to be resourceful, using every part of the animal—such as a pig— in their meals. That’s how they created the unique Cajun sausage known as Boudin. Cajun food also uses great seasoning; lots of celery, onion and bell peppers; but no tomatoes. And as we were about to find out, they love to use sauces. At the Razzoo’s in Plano, after being greeted by friendly GM Mark Campbell, we joined a group of food writers. Our mission was to sample a wide variety of Cajun foods, ranging from shrimp to gator, while tasting a mind-boggling array of sauces. In all, we sampled 15 sauces. We started with a sharp, peppery flavored Meuniere, meant to be paired with blackened Tilapia. From there we tried Crawfish Lemon Butter, Etouffee, Creole Cream, Fais Deaux Deaux, Jalapeno Cheese, Creole, and BBQ Ouch (for the Gator tail). We also tried Hurricane (spicy, savory, and sweet) that pairs with Hurricane Shrimp. My favorite sauce was Razzoo’s hot sauce, which (to my taste) goes with anything and everything. We also tried some not so spicy dipping sauces. These included cream gravy, honey mustard, cocktail sauce (another personal favorite), Cajun buttermilk, and spicy tartar sauce. 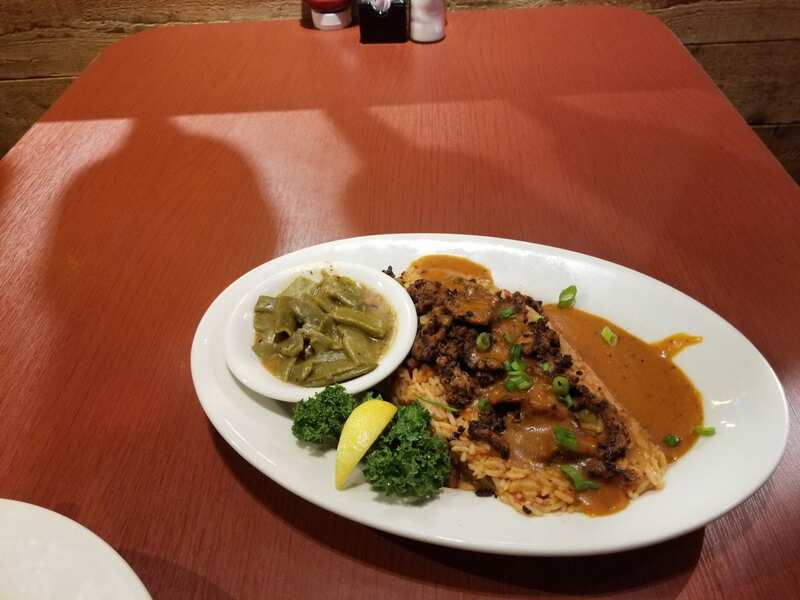 Along the way we tried blackened salmon (paired with the Fais Deaux Deaux), Shrimp Creole, catfish (paired with Jalapeno cheese), and Crawfish Etouffee. We were offered large Mason Jar Chillers to keep the heat at bay. Mine was a Watermelon Crawler (sweet white wine, Watermelon liqueur, fruit juices and Sprite). All topped off with a slice of watermelon, which was really refreshing after all that rich food. The Plano Razzoo’s is located at 3904 Dallas Parkway, but there are a number of additional locations around the Dallas-Fort Worth area. 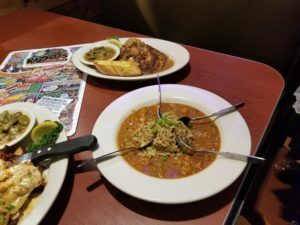 Razzoo’s has been serving up Cajun food and fun for 26 years now, and keeps expanding to new locations. Closest to home is Razzoo’s at Hilltop Village in Cedar Hill. No matter which Razzoo’s location you try, go hungry and prepare to get saucy!